When I was in high school, I had a chemistry teacher once who told us, “If you can cook, then you can do chemistry.” I remember finding this very odd, because I knew nothing about how to cook, and most of my attempts were met with little in the way of success. I am pretty sure that in the 10th grade, I was not alone in that regard. Fast-forward to adult life, and I cannot say that I feel all that much more confident in the kitchen. In fact, in many ways I still feel like that kid in chemistry class. It is amazing watching the transformations that take place in my pots and pans when I am cooking, but my understanding of what I am doing is still pretty unsophisticated. Like my experiments in the lab, many of my experiments in the kitchen fail. Thankfully, just as there are cheat sheets that you can buy to help you pass your chemistry class, there are cheat sheets you can download online to help you cook with confidence. Following are 60 awesome infographics cooking charts which will help you cook up a storm in the kitchen! 1. Make the ideal chocolate chip cookie. 3. Check out some actual chemistry. 5. Figure out how much cake you need. 6. Figure out which decorating tips to use on your cakes. 7. Replace your eggs for vegan baking. 9. Steer clear of common baking errors. 10. Make any kind of buttercream frosting you can imagine. 11. Make a mug cake. 13. Whip up the most amazing batch of whipped cream ever. 14. Check out a field guide to cookie taxonomy. 15. 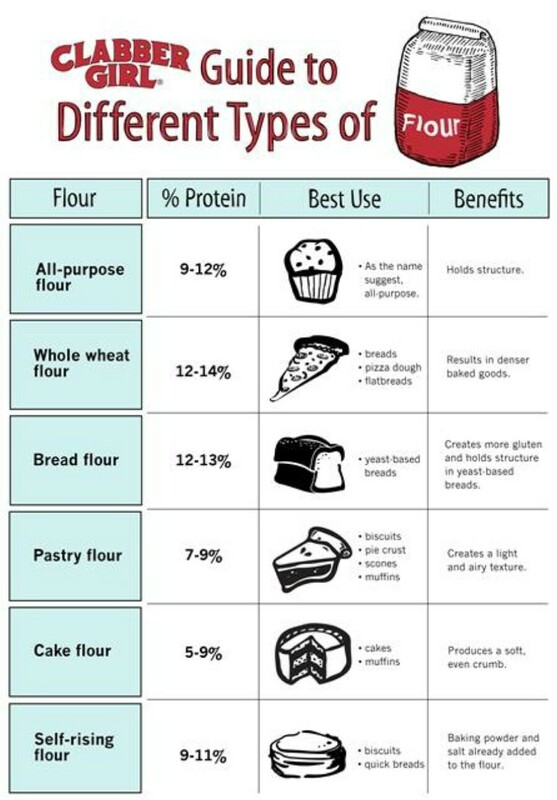 Learn all about the different types of flour. 16. Learn how to bake with Greek yogurt. 17. Learn how to make an apple pie. 18. Figure out what the heck went wrong with your cake. 19. Get the right texture with your chocolate chip cookies. 20. Use the right food processor and blades. 21. Which apples are best for which applications? 22. Learn your buttercream tip sets. 23. 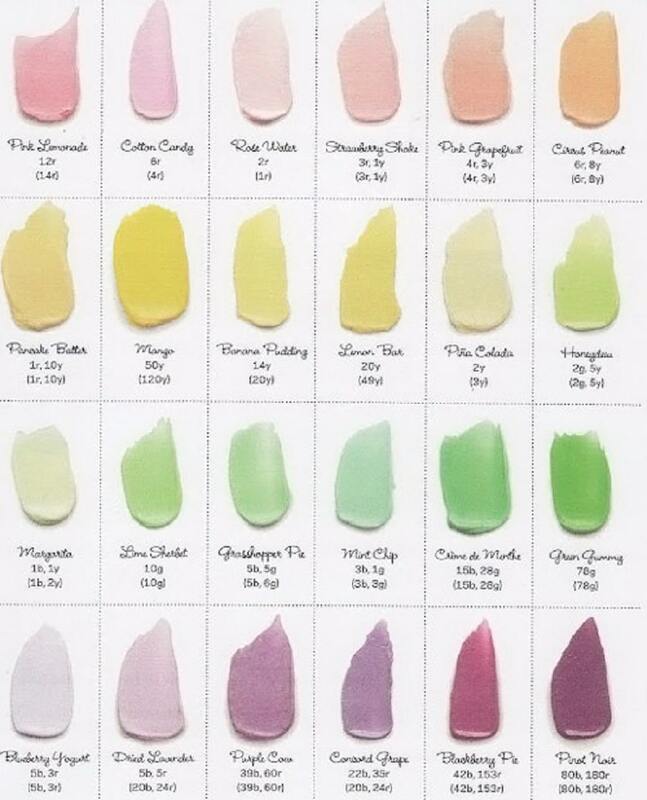 Check out another awesome color guide for frosting. 24. Learn how to divide any recipe in half. 25. Get your metric conversions right. 26. Don’t fall victim to a baking emergency. 27. Make the perfect starter bread. 28. Bake your own pizza crust. 29. Bake mouthwatering cinnamon rolls. 30. Know your mushroom taxonomy. 31. What is the difference between a dash and a pinch, anyway? 32. Learn how to cook in and care for cast iron skillets. 33. Learn how to grill your favorite fish. 34. Slow cook with success. 35. Learn the flavor profiles of all spices. 36. Know your reginette from your radiatori. 37. Which knife should you buy? 38. Learn how to combine spices into blends. 39. Figure out which types of spices go in which types of cuisine from around the world. 40. Find out which cooking oil is best to use. 41. Here is your guide to all the different flavor profiles. 42. Make your own perfect customized salad dressing. 43. Make non-boring salad every time. 44. Cook your meat at the right temperature. 45. Learn how you can cook with fresh herbs. 46. Here is a more detailed guide to cooking oils. 47. Store your food so it will not spoil. 48. Discover simple vegan food substitutions. 49. Learn how to cook any vegetable. 50. Season your … salt. 51. Make kimchi at home the easy way. 52. Can You Freeze It? Let’s Answer This Age Old Question. 53. Make delicious flavored water. 54. Choose the right type of steak for your recipe. 55. Make your own customized trail mix. 56. Recognize every type of apple on sight. 57. A guide to oils by smoke point. 58. 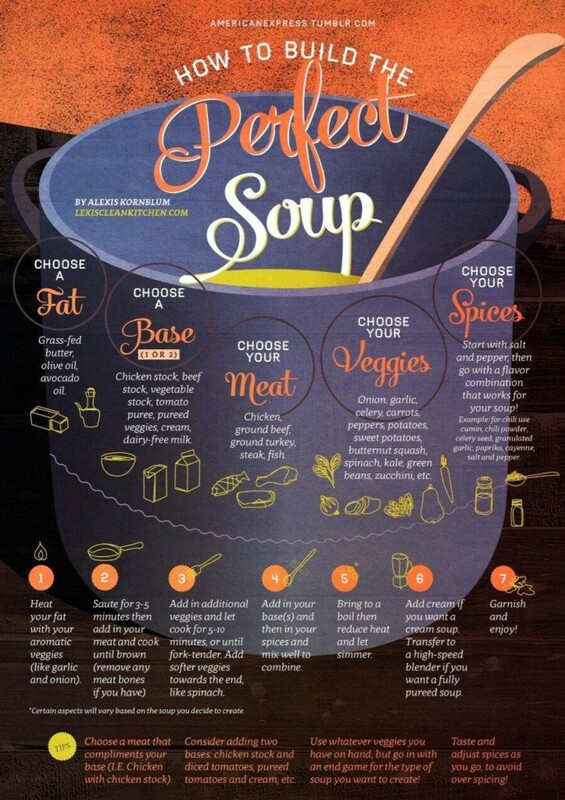 Concoct the perfect soup. 59. Learn how to stir-fry. 60. How should you marinate your meat, fish, and veggies? I am going to share infographics with you which teach you how to do a wide variety of cooking preparations, but I want to start with a bunch of baking charts first. Why? Baking intimidates a lot of people. As a result, there are a ton of infographics which cover it. Believe me, after reading these, you are going to find baking a lot more approachable. You know how some chocolate chip cookies are thick and gooey, while others are wide, flat and a bit crispy around the edges? For the longest time, I thought that the outcome was an accident, not something you can easily control. 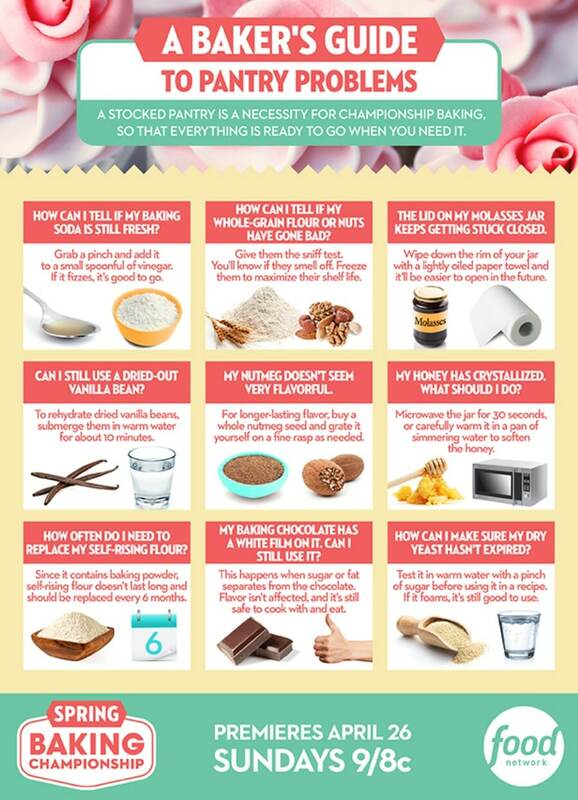 But as this infographic demonstrates, you can determine exactly how your chocolate chip cookies are going to turn out based on how much sugar, baking soda, and baking powder that you use. 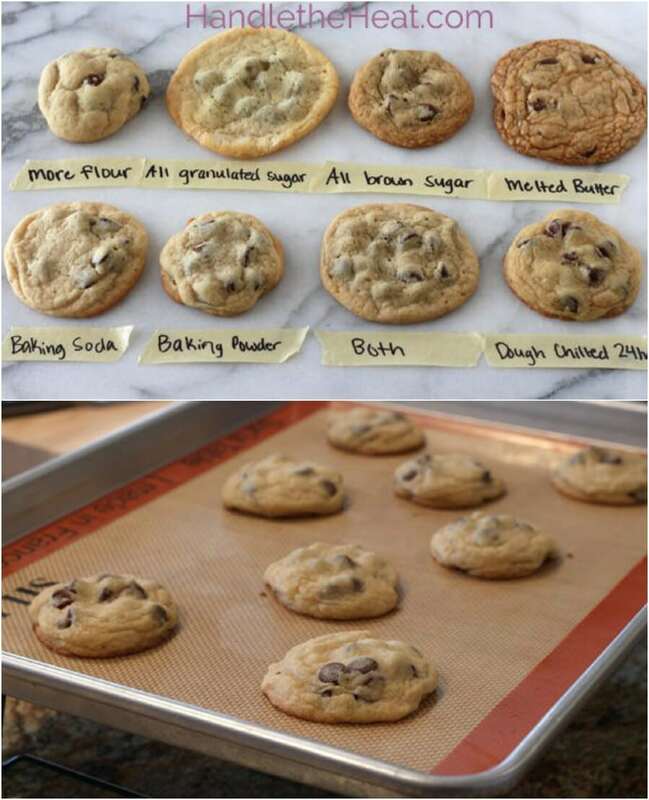 So next time you decide to bake, you can make perfect cookies. I love eggs in my cooking, but I have to admit that sometimes they get a little bit confusing for me. For example, what exactly is the “albumen?” And just how many eggs are in one cup? I used to have a thousand unanswered questions, but now I know everything that I could possibly need to about how to bake with eggs. Just check out this amazing infographic from Chasing Delicious. When I was actually in my chemistry class, I complained a lot, probably because I was getting a “D.” Secretly, however, I was completely fascinated by the subject, and if I had not been under so much pressure to get the grade, I probably would’ve been having a pretty fun time. So naturally I got very excited when I found this extensive infographic which teaches a little bit more about the actual science behind baking! Yes, it is pretty long, but if you read through it from top to bottom, I promise you will learn a ton. I’ve always struggled to know when my baking supplies have expired, and when I can still use them. For example, whenever I would find that my honey had crystallized, I would assume that it had gone bad and I would throw it away. Then I discovered this handy chart, which taught me that simply putting the honey in the microwave for 30 seconds is enough to salvage it. That tip alone has already saved me a lot of money. All of the other information in this chart is also incredibly useful. Are you in charge of figuring out dessert for a party? If so, you may find yourself fretting when it comes time to either bake or purchase a cake. Terrified of getting too little, you end up getting way too much. But now, you no longer have to worry about estimating incorrectly. This helpful chart will tell you exactly how much cake you need in any dimensions that you require to serve all of your guests. When it comes to making a cake, I usually find the decorating even more intimidating than the baking. There is nothing more frustrating than going to the trouble of making the perfect cake only to mess it up when it comes time to put the lettering on top. It is very difficult to know exactly which decorating tips produce which results. But now I no longer have to worry about playing that guessing game, because I have found a chart which explains it all! 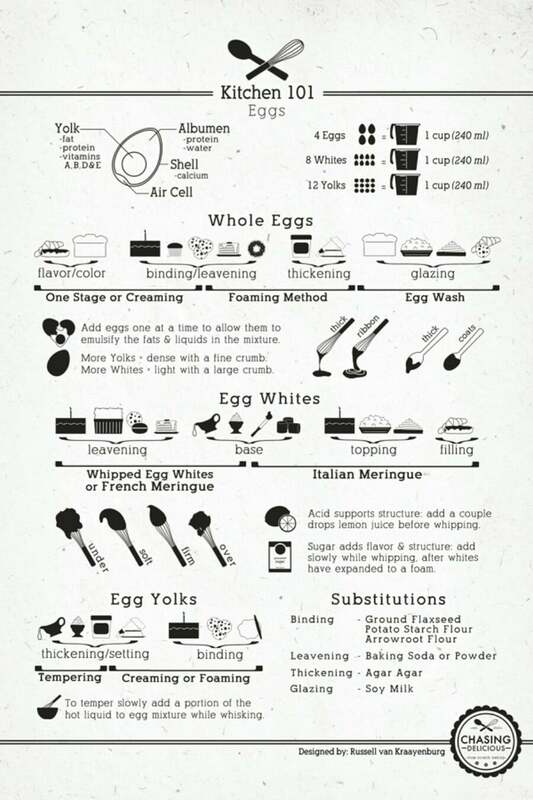 Previously, I shared a chart with you which taught you everything that you could possibly need to know about baking with eggs. But what if you are a vegan and do not want to use eggs at all? This handy infographic teaches you about a number of genius substitutions and which recipes they work best for. Something else that you may not want in your food is gluten. Gluten sensitivities are fairly common (and can wreak havoc on your body), but learning how to bake without using gluten can be quite challenging without the right resources. 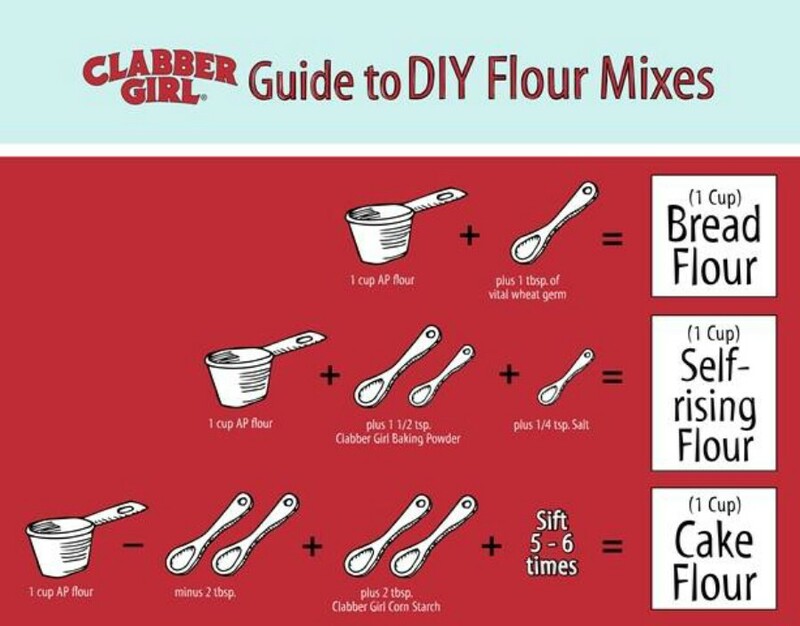 Here is a very useful chart which will help you to make the transition to gluten-free baking. A lot of the mistakes that I make while baking seem to come down to not properly understanding, interpreting, or applying directions. 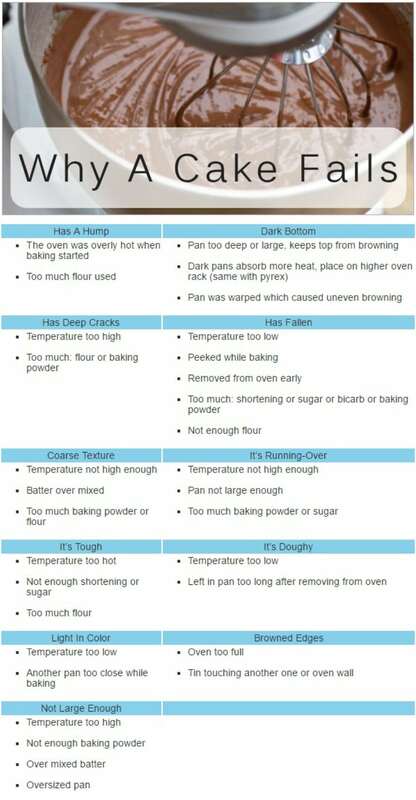 I did not realize this before, but it all makes a lot more sense now that I’ve found a chart of baking measuring do’s and don’ts. While some of these may seem like common sense, all of them are also common mistakes. So don’t feel too bad if you’ve made a lot of them. If you enjoy buttercream frosting, and are looking for a fast and easy guide to buttercream recipes, you’ll love this chart. Learn how to make coconut cream, peppermint, pistachio, red velvet and more. Ever feel desperately like a cake, but don’t want to bake one in the oven? If you have a microwave and a mug … you can have cake. Here is a quick and brilliant infographic which teaches you a number of mouthwatering mug cake recipes. All of these can be ready in minutes—and yes, that even includes prep time! Can’t find the exact color of frosting or food coloring that you want at the grocery store? Being as there are only so many colors available, most of them bold primary hues, that is not surprising. What if you want an obscure shade like a soft orange or peach, or an olive green, or a light teal or lavender? 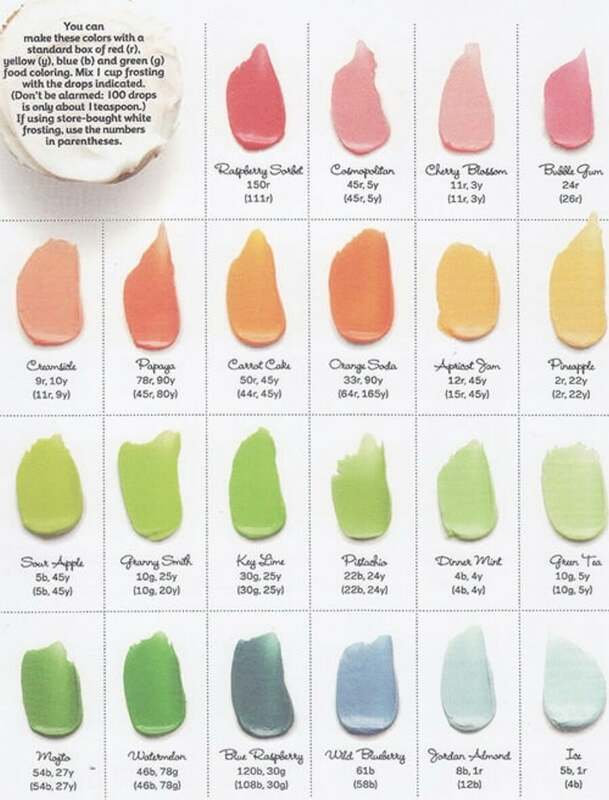 This cupcake icing color chart was posted by Handmade Charlotte and comes from Food Network Magazine. With it, you can add some subtlety to your cake! What’s awesome is that any of these hues can be mixed using nothing more than standard red, yellow, green, and blue food coloring! Recently I learned how to make fresh whipped cream at home for the first time ever—talk about being blown away by chemistry. But I had no idea that you can make all kinds of fancy flavored whipped cream, for example peppermint whipped cream or maple-vanilla whipped cream. These recipes just take a few simple additions. This chart really opened up a whole world for me! Is it really important to know the different kinds of cookies? I’m not talking about “chocolate chip,” “gingerbread,” and so on, but classifications: bars vs. drop cookies vs. molded cookies. Maybe you don’t need to know this stuff for everyday life, but it can be very useful if you are digging through a recipe book and need to know which section to turn to. This chart will help you flip to the right page! 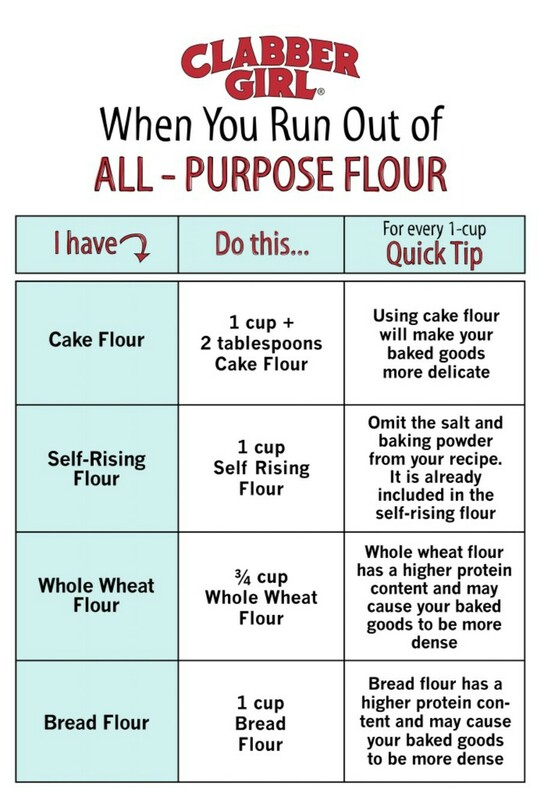 Maybe you have just run out of all-purpose flour and are wondering what you can make with the flour you do have on hand, or perhaps you are at the grocery store just trying to figure out which type of flour you need to buy. In either case, you may not know which types of flour are best for which applications. Find out with the following three cooking charts from Clabber Girl! 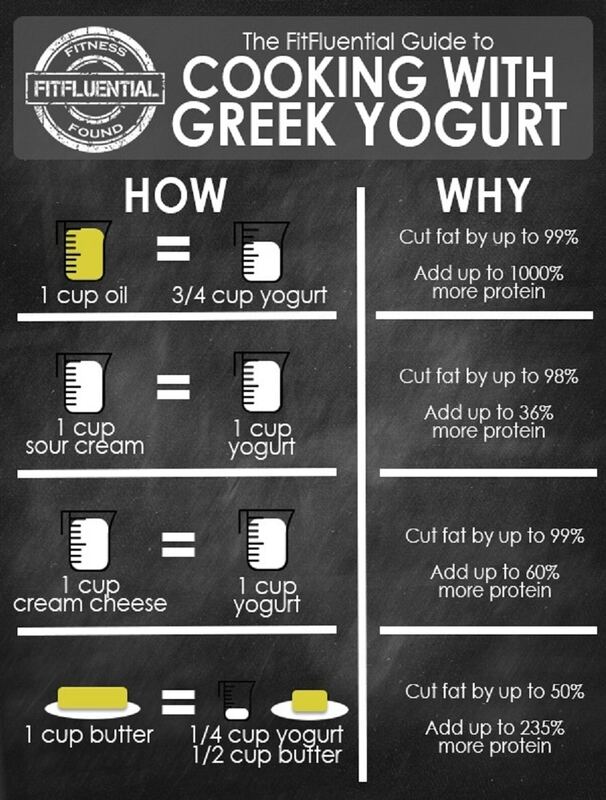 If you want to cut back on fat and ramp up protein in your favorite baked recipes, try replacing ingredients like cooking oil and sour cream with Greek yogurt! The chart below will teach you how and sell you on the benefits. Are you someone who learns better by looking at pictures of steps than by simply reading the words? If so, you may find it hard to follow along with some recipes as they are traditionally presented in cookbooks. If you have struggled to make apple pie (and pies are notoriously difficult to bake) without visual instructions, you are going to love this step-by-step pie-baking recipe infographic! Nothing is more frustrating than putting a ton of effort into baking a cake only to pull it out of the oven and find that it has a weird hump in it, it’s a strange color, or the texture is all wonky. What can it mean and how can you fix it? Search for your cake issue in the chart below to find out what might be going on—and to discover any possible solutions to save your cake! One of the first infographics I shared with you taught you about what you need to do in order to get your cookies to turn out the way you want. That graphic focused a lot on shape, but also a bit on texture. Here is yet another useful graphic which teaches you even more about how to get the perfect chewy or crisp consistency to your chocolate chip cookies. For the longest time, I didn’t know a food processor from a blender from a stand mixer. And all those attachments? Don’t even get me started on all the mistakes I made when I purchased my first food processor. I could have avoided them all if I’d just had this graphic! I already shared an infographic with you which taught you how to bake the most delicious apple pie you have ever eaten. But how do you know which apples to use? There are so many different kinds, each with their own unique flavors and textures. This graphic will help you figure out which types of apples to buy for pies, cider and more. Previously I shared a couple of graphics from u-createcrafts.com. I have already talked about picking the right tips for frosting, but honestly it is so hard to get it right that more infographics can’t hurt. Here is yet another great one from u-createcrafts.com! 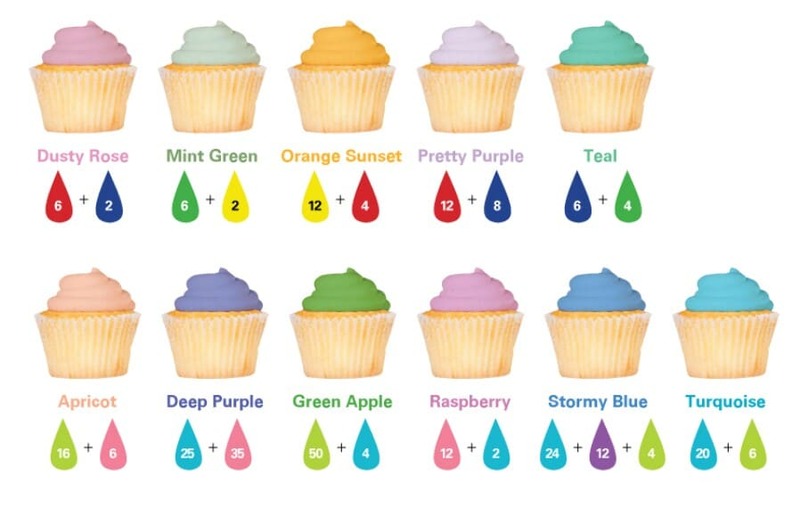 I have already shared one excellent guide with you for mixing any color of frosting you can imagine using nothing more than the simple primary hues of food coloring which are available at any grocery store. But sometimes it helps to see the same information presented in a different format, so here is yet another great guide! Splitting a recipe in half shouldn’t be all that difficult—but let’s face it—all of us can make simple math errors, and that isn’t something you want to risk when it comes to making a recipe, is it? To save yourself the time, math and hassle, just use this chart. I still have a few old cookbooks lying around, but I get most of my recipes from the internet these days. The problem with that is that a lot of the recipes I find come from overseas (that is just going to be par the course if you are into making European cuisine like I am). But that means they use … you guessed it—the metric system. I am terrible at metric conversions, which is why I now reference these awesome charts. You know that moment … you have just slaved away in the kitchen for three hours, and you open the oven to pull out your cake/pie/etc. … and something is wrong with it. You freak out, wondering if it is ruined, if you will have to start all over, if there is anything you can do to prevent it from happening again the next time. Yep, it’s a baking emergency. But you don’t have to call 911—just reference the chart below to save the day! Okay, I’ll be honest … I didn’t have a clue what this chart was about until I looked up “starter” in baking and found out what it was. A “starter” is a mix of water, flour and a leavening agent which you can use instead of simple yeast. Now that I know that, I can appreciate the immense awesomeness that is this chart. If you are looking for a cheaper, more nutritious pizza than what you would buy in a box in the frozen section of the grocery store, you can try making your own. Homemade pizza is seriously scrumptious, but it is super daunting to a lot of cooks who have never tried it before. 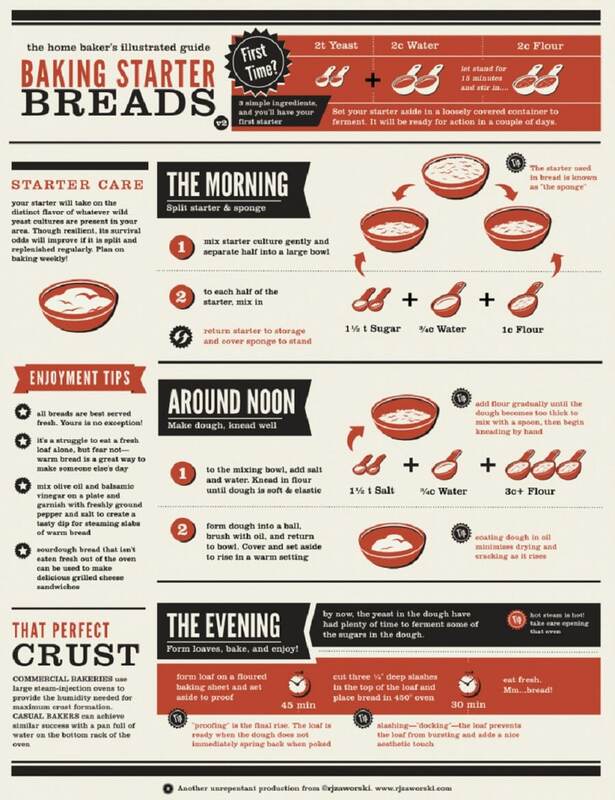 This infographic makes the crust easy! Cinnamon rolls, like pizza crust, tend to intimidate a lot of people who are inexperienced with baking. 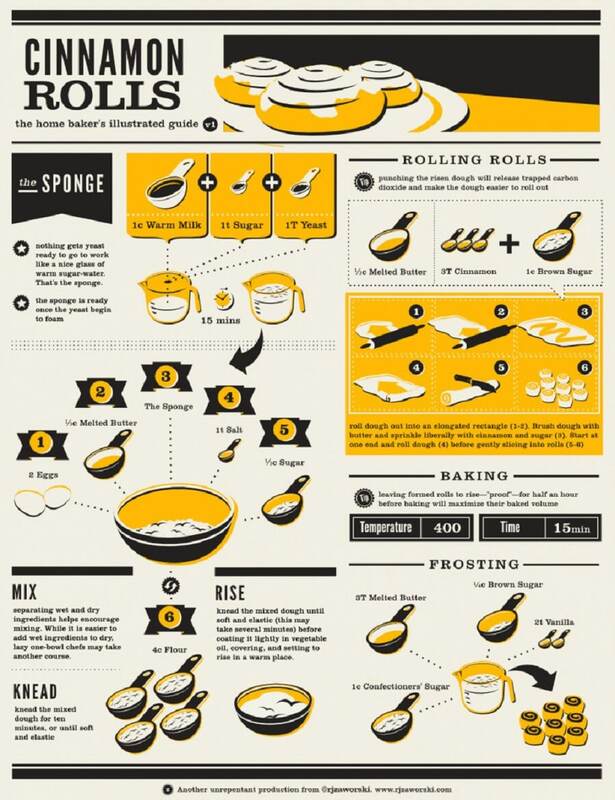 Thankfully cinnamon rolls are easier than you think, especially if you have a great infographic on your side. Check it out, and enjoy an amazing breakfast! 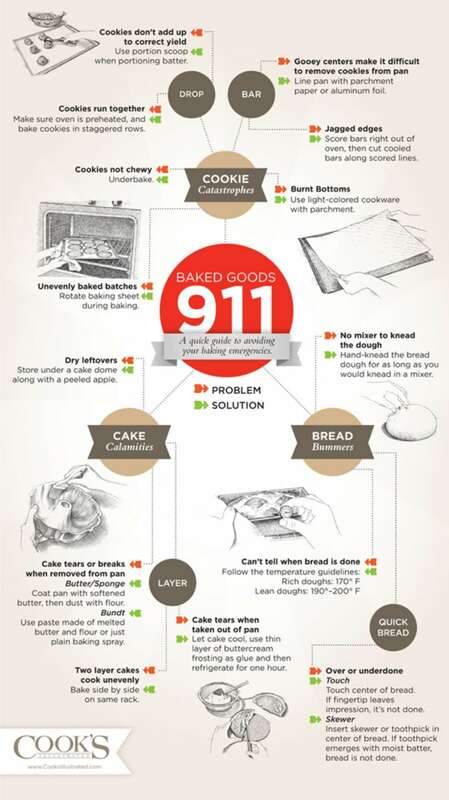 Now that we’ve thoroughly covered baking, it’s time to check out some infographics which teach you how to prepare other recipes. These charts cover cooking terminology, nutrition, flavors, techniques and more! When I am in the produce section of the grocery store, I am fairly flabbergasted when it comes to picking out mushrooms. I mean, one mushroom looks very much like the next to me, and aside from “shiitake,” I am pretty much lost. Thankfully I now have a useful chart which will help me to buy the right mushrooms for soups, sauces, salads, and more! Admitting this may make me look like an idiot … but whenever I read “dash” or “pinch” in a recipe, I always interpreted that mentally to mean, “Grab a little between your fingers and sprinkle it in.” That’s obviously not an amount, nor is it any sort of technical definition. So I was astonished to learn from this infographic that there is a technical difference between a dash and a pinch. For the longest time, I wanted to get a cast iron skillet. My non-stick pans were frankly creepy—I mean, who wants that nasty stuff in their food? But I was really daunted by cast iron; I knew that caring for it takes extra time and effort, and I was worried about using the pans improperly. I finally caved in and bought my very first cast iron skillet the other month, and it has been a phenomenal decision. If you feel like you need a little extra guidance to make the switch, I suggest you check out the graphic below! SheKnows.com produces so many ridiculously amazing infographics. It seriously seems like every other chart I’ve included in here came from there. This one teaches you the best seasoning, cook time, and directions for halibut, salmon, tilapia, and more. I own a crockpot, but I have to admit that I don’t use it nearly as much as I should. Whenever I do, though, I am astounded by just how delicious the food is—and because you can prepare so much at a time, it’s cheap as well. I am actually really excited to challenge myself and pull out the crockpot again now that I’ve found a great chart that taught me how I can build great slow cooker recipes from the ground up. It’s weird … despite the fact that I have obviously eaten plenty of spices throughout my life, I can’t for the life of me explain what any one of them tastes like on a technical level. That can make it incredibly hard to figure out how to spice up a recipe. This chart makes it easy by telling you exactly which flavor profiles can be assigned to every common spice. So if you want to add an earthy flavor or a bit of sweetness to a dish, you know exactly which spices you can use. The other day, I got into a discussion with someone about pasta shapes and which ones we liked best. I thought I was having a tip-of-the-tongue moment, but really there is no way I could have known that I wanted to say I liked gemelli pasta best. Seriously, there are so many different shapes of pasta—and apparently a lot of guidelines for which shapes work best with which dishes. So you know you need a special knife of some sort for cutting meat, but you’re at a total loss when you actually head to the store to try and figure out which type of knife you should buy. Here is a quick and dirty guide to knives of all kinds and what you can use them for in the kitchen. I used to think that “chili powder” was an actual spice. I now know better—chili powder is a combination of spices including Ancho chile, paprika, cumin, and Mexican oregano. I would have learned that a long time ago if I’d had this chart. Have you ever sat down to eat a meal at a restaurant or at someone’s house and it just tastes wrong for the region of the world it is supposed to originate from? Like someone serves you “Thai” food and it tastes American … or Mexican … or Indian … or something else. It all comes down to the spices. If you get those wrong, the food will taste like it comes from somewhere else. Get it right, and the food tastes great. You can choose your cooking oils based on nutritional requirements, but you can also decide what to use based on the flavor profiles of the oils and the types of ethnic cooking they tend to be associated with. If you are interested in the latter and not the former, this exquisitely simple chart will help you out. A few infographics on this list have helped you to identify ingredients which are salty, spicy, sweet, and so on, but how do you know which flavor profiles you actually want in your cooking? For example, when do you want to add umami to a dish? What will it achieve? Find out in the chart below. I am so picky about salad dressing; I want everything to be natural, but I don’t like a lot of the combinations in the store, most of which are too sour or bitter for me. 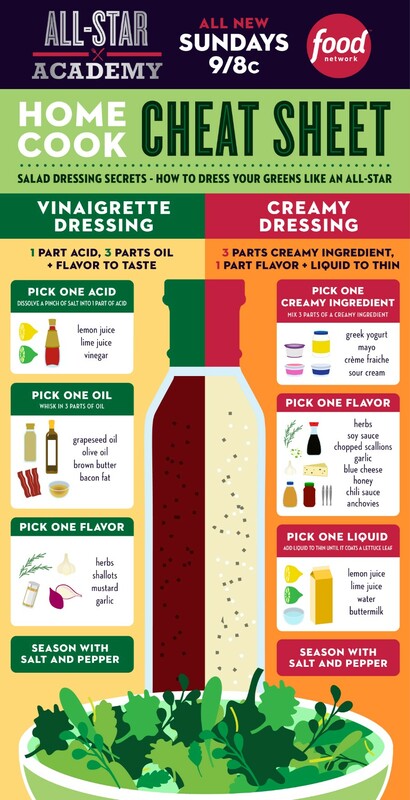 I just found an infographic which teaches you how you can mix your own salad dressing from scratch—either vinaigrette or a creamy dressing. Now that I know how to do this, I will always have the perfect dressing! Making salad truly is an art form. You might not be cooking (unless you want to of course), but a salad needs to include just the right interplay of flavors, textures and nutrition to really succeed. If everything is the same texture for example, salad just seems sort of “blah.” If you are at a loss for what to combine, this graphic will help you to make delicious, exciting salad every time. Cooking your meat at the right temperature is a matter of both safety and taste, so it’s vital that you get it correct. Personally I find it a real pain to try and remember the exact temperature for every type of meat. This infographic makes it easy! One of my neighbors recently started growing basil and is completely clueless what to do with it. It’s hard to blame her—most of us are used to purchasing dried herbs in a bottle, and may not even recognize fresh herbs when they’re still in the ground or in the pot! This infographic will teach you how to recognize, store and use them in your cooking. Earlier I shared a very simple, elegant infographic with you which explains which cooking oils to use for different types of cuisine. I liked that graphic for its simplicity and attractive presentation, but sometimes you need more information. Here is a more detailed one which includes info on smoke point, shelf life, and more! “Do I wrap this up or do I just leave it as it is? Will putting it in the fridge preserve it or will that just rot it faster?” I seem to ask myself questions like these all the time—and more often than not, I guess the wrong answer and ruin my food (especially my produce). Now I don’t have to guess anymore, and neither do you. This chart makes it ridiculously easy to see exactly how and where to store your produce, herbs, meat and more—and how long they will last! One of the hardest things about switching to a new diet is knowing what you can and cannot eat. That can be even more challenging than staying disciplined! 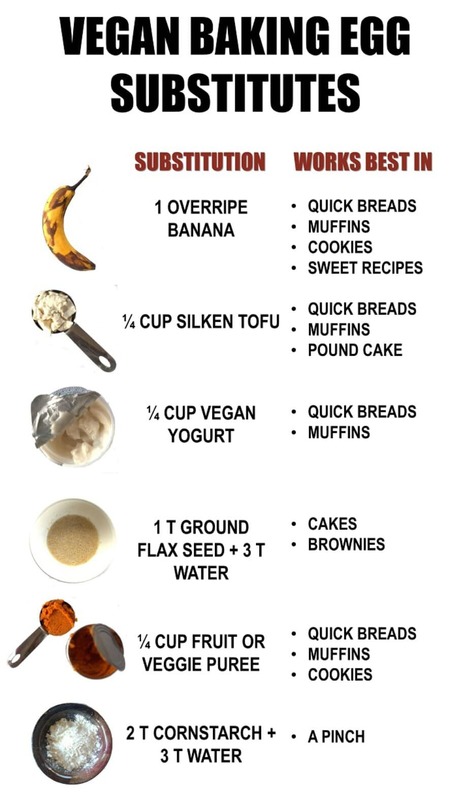 Here is an awesome chart which makes vegan substitutions absurdly easy! Have you ever been in the produce aisle thinking, “Hmmm … I really should eat some more greens … I want to try this burdock stuff or maybe some rabe … but I don’t have a clue how to prepare them?” With this handy infographic, you will never have that problem again! Okay, I have to admit I never once in my entire life thought about spicing up my salt by flavoring it. But now that I see this chart, it does have a definite appeal. I mean, what does rosemary-lemon salt or buffalo-ranch salt taste like? I want to know! I have always loved kimchi, but the idea of making it seemed really intimidating. 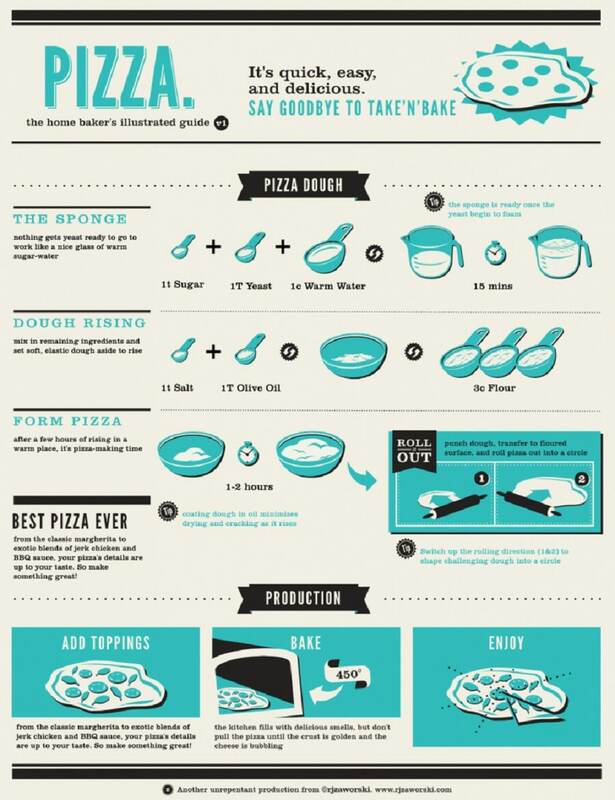 Now that I’ve seen this simple recipe infographic, I wonder what was wrong with me. This actually looks almost ridiculously easy. Seriously, where was this graphic my whole life? If there is one question which seems to be bandied about my kitchen a lot, it’s “Can we freeze this?” Now all I have to do to answer it is call up this infographic. I remember when flavored water first started turning up in stores, and I thought, “Wow, this is a thing?” Well, the newest health trend is to make your own flavored water at home using real fruit and vegetables. This infographic teaches you some great flavor combinations you can try and the health benefits of each. If you are making a recipe and you are very lucky, the cookbook or recipe site will specify the cut of meat that you need. But it seems like more often than not, you are simply left to guess and hope for the best. With this useful steak cut chart, you never have to guess again. The idea of making trail mix is simple enough … grab a few snacks and treats you enjoy and mix them altogether. But as with making salad, you need a certain variety of representative snacks from different categories to achieve the right tasty and nutritious effect. If you are looking for ideas, you’ll find them in this infographic. When you are at the grocery store, how do you decide which apples to buy? Sometimes they are nicely labeled and it is easy to tell one from the next. But other times it can be hard to figure out where to begin—and even when you do figure out which ones are which, you may not know which fit with the recipe you want to make. 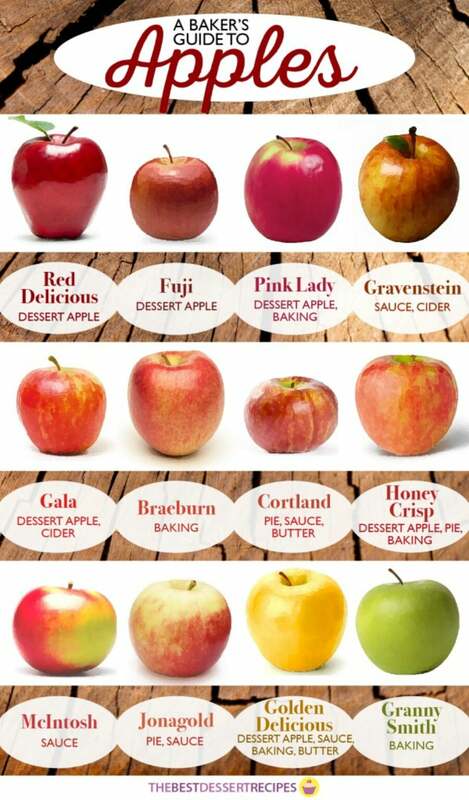 This chart makes it easy to identify apples at a glance. While one of the other oil charts that I shared with you included the smoke point for all the different types of oil you are likely to consider using in your cooking, that information wasn’t easy to see at a glance. 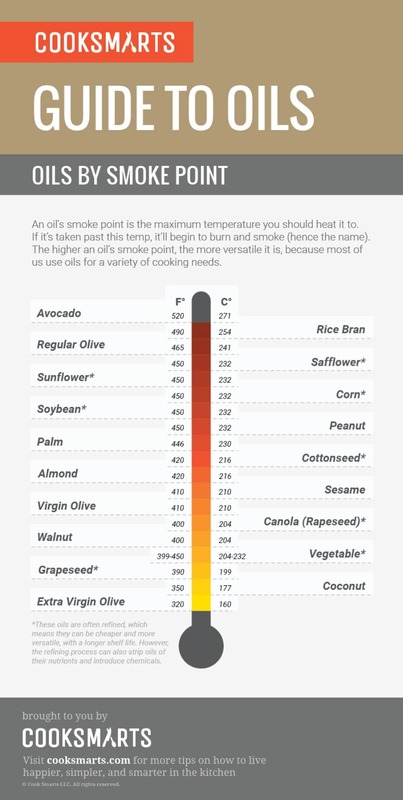 If smoke point is your main consideration, you will be able to instantly find out which oil is best to use with this chart. If you have made a lot of soups, you may have started figuring out some of the flavor rules which govern them—and maybe you have even experimented a bit, modifying recipes and trying to create your own. This chart will teach you everything you need to know to whip up the most delicious soup yet—one which you invent from the base up! Stir-frying is awesome. It is a pretty healthy way to cook, and there are limitless different ways that you can combine ingredients for a delicious meal. If you are new to stir-frying and need a little guidance while you explore the culinary possibilities, this infographic has you covered. Marinating your meat and vegetables really deepens their flavor, making for a gourmet meal. Not sure what to marinate your food in or how long you need to wait before it’s done? This chart has all the answers! Now you have all the infographics you could possibly need to make gourmet magic in the kitchen. Print these out and stick them on your fridge or tack them to your kitchen wall. They will revolutionize your culinary life! I find charts like this very handy. The information is easily accessed and a wonderful reference tool. Thanks for such a nice variety of information. This is awesomeness, can’t wait to try these things out for family fun night! Thank you ? Thank you so much for compiling this. It’s very helpful. Superb compilation, but….how can I print them???? Right-click, save image as. Open image on computer, print. FYI,the sirloin is a “STRIP STEAK”, THE t- bone is a “PORTERHOUSE”, & the rump is a “SIRLOIN. I really liked this article full of great advice and amazing pictures for explanations. Everyday I eat lunch at my workplace that’s why I’m always looking for delicious meals to cook! these are the basic but very important information, which each and every person must know. Can I copy them and distribute among my friend’d daughters? I remember finding this very odd, because I knew nothing about how to cook, and most of my attempts were met with little in the way of success. Wow!! These menus look absolutely delicious! Thanks for posting them. Hi. I am retired with a small blog. I came across your charts in Pinterest and was wondering if I could publish one every so often (e.g., monthly or bi-monthly. I would of course link back to your site and include whatever introductory content you wish. Every home cook should have these plastered on the inside of every cupboard door and some are worth framing! Holy cow I feel like I just went to cooking school!!! Are any of these charts available as posters or printouts?